My “homemade” project this week is figuring out my dehydrator. 🙂 I borrowed one from my in-laws a few months ago but since then it has just been sitting there staring at me. You see I hate to read manuals and this contraption appeared to require manual-reading. I decided to pick a pumping session and flip through the manual. No pressure. Maybe I could figure it out through the pictures. It’s pretty easy. You basically plug it in and pick a temperature. Fruit dries at about 130 – 140 degrees according to my manual. When I got the dehydrator cleaned and ready to go, I started having fun. Luckily, I did read that I could not submerge the base in water. So no electric shocks. Good thing. I first did a round of apples, bananas and cantaloupe slices. They turned out great! The dehydrator is pretty loud and it takes most of the day so you should plan accordingly. Just think, dried fruit or veggies without extra sugar or chemicals! 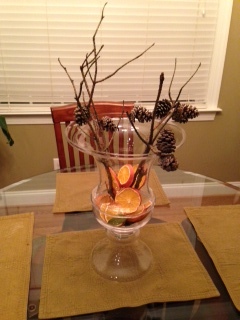 I also tried dried oranges for some sweet-smelling decorations. Can’t wait to try some fruit leather! Who needs fruit roll-ups?! Categories: Homemade Goodies, Money $aving Ideas, Recipes | Tags: Carrot, cooking, Dehydration, dehydrator, Dried, Dried fruit, food, Food dehydrator, fruit leather, fruit roll ups, manual reading, Produce, Shopping | Permalink.